Military court upholds 6-year term for ex-Russian general convicted of corruption | Russian Legal Information Agency (RAPSI). MOSCOW, October 31 (RAPSI) – The Moscow Garrison Military Court has upheld a 6-year prison sentence for the former commander-in-chief of the Interior Ministry’s internal troops Vyacheslav Varchuk convicted of taking an especially large-scale bribe, the press service of the Main Military Prosecutor’s Office reports. The sentence has become effective, the statement reads. 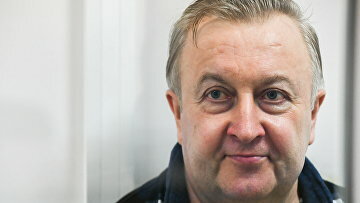 The Moscow District Military Court convicted and sentenced Varchuk on July 19. The defendant was also fined 20 million rubles ($305,000) and lost his rank of General Lieutenant. The court found that in 2015-2016 the defendant and his alleged accomplice, subordinate officer Alexander Kostin, received a bribe for assistance in additional financing communications department of the Chief Command of Interior Ministry’s internal troops. According to the sentence, Varchuk induced Kostin to use the latter’s power to include 10.5 million rubles ($160,000) to a federal budget. Investigators believe that the defendant wanted to lift suspicions from himself. Kostin admitted guilt, testified against the Lieutenant General and in October 2017 was sentenced to a four-year suspended term. Varchuk himself denied wrongdoing. Prosecutors asked the court to sentence the defendant to 12 years in a high security penal colony. Lieutenant General Vyacheslav Varchuk has acted as Finance chief of the Chief Command of the Interior Ministry’s internal troops since December 9, 2002.